Nearly seven years ago, I lived in Singapore. When I was living in Singapore, I met two girls from Brunei. When Jacob and I decided to visit Malaysian Borneo this year, I got in touch. This guide to Bandar Seri Begawan would not have happened without B & D. Thanks to B, D, and C for showing me around your beautiful city and showing me the best things to do in BSB Brunei! I met some other travelers around Malaysia who complained that there weren’t many things to do in Bandar Seri Begawan and that it was boring (mostly because they couldn’t go out to bars). I really have to disagree as I loved the laid-back vibes of Bandar Seri Begawan where dinners go for hours and we felt there was PLENTY to do, more than we even got to do. ​Compared to much of our Borneo trip, BSB felt chill and it’s not like what you would expect in any way: people are super friendly, the food is ridiculously good, it’s not too expensive (but you’ll get some sticker shock coming from Malaysia), and everyone speaks English. BSB is not where to come to party and Bruneians love cars as much as anyone, so you might need a car (or a taxi) to see some of these attractions in Bandar Seri Begawan. So choose your accommodations in BSB wisely. It’s best to be close to the waterfront. Please pet all the kittens for us. I cannot say loud enough that Brunei is truly unique, beautiful, and worth visiting. The Kampong Ayer water village served functionally as the capital for many years, however people have fairly recently decided to move to the mainland. Thousands of people still commute to work daily from the water village. At minimum, spend some hours getting lost in this beautiful living piece of history. Many water taxis will try to get you to do a water tour of the water village, but don’t feel pressured as you can see it well on foot too. If you’re lucky enough, you can stay in a traditional house in the water village with one of the residents. There’s something magical about sitting out on the balcony at night chatting away with Kem, who knows everyone there is to know in the tourism business in Brunei. I paid for my own stay and loved it. A lot of people only come to Kampong Ayer for the day, which is very doable. All you need to do is take a water taxi from the steps of the Brunei water across the water. It should cost around 1-2 Brunei dollars. From there, you can enjoy the colorful houses and visit the village museum. This museum recounts the history of Brunei and the water village itself. It also shows off traditional textiles and photos of what the water village used to look like (there used to be a floating market). Also, consider having lunch at the sometimes open restaurant that you pass as you exit on the right. Despite being famous for oil, Brunei has some truly amazing ecosystems, including perfectly preserved mangrove groves where you can spot wild proboscis monkeys. It’s best to go to the mangrove groves close to sunset when the monkeys are the most active. If you’ve been elsewhere in Borneo, including the Kinabatangan River Valley, you might want to skip this. It’s still incredible how much work Brunei has put into the preserving the ecosystems! The Sultan Omar Ali Saifuddin Mosque is considered to be one of the most beautiful mosques in Asia. The gold dome, the elaborate cut-outs, and the back are beautiful. It’s easy to see why you can’t miss the Sultan Omar Ali Saifuddin Mosque when you’re visiting Bandar Seri Begawan and you won’t as it’s right in the middle of the city. It’s free to visit although women will be given a robe to cover their clothes as well as a hijab. The staff is delighted to pick out an outfit that they think will complement your complexion although note that non-Muslims cannot enter beyond taking a brief look into the mosque. It is free to visit the Sultan Omar Ali Saifuddin Mosque. This museum, where photos are prohibited inside unless you’re with a tour group, surprised me quite a bit. The staff will take your bag as well as your shoes when you enter, a good thing to know as it surprised me. I really enjoyed it as I was amazed by the gifts that other countries give each other even for small occasions. 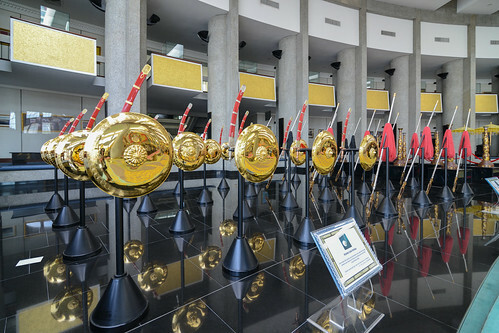 It was definitely a unique museum (that is also free to visit), so if you’re into off the beaten path places, consider visiting this museum in Brunei. The showstopping pieces are definitely the chariots (as well as the matching armor) although I really loved some of the paintings given as gifts. It takes about 1-2 hours to visit the Royal Regalia Museum and there’s no entrance fee (at time of writing). The waterfront in Brunei is being developed more, but you’ll find a lot of well-developed pedestrian paths that make it easy for tourists to discover Bandar Seri Begawan. At minimum, admire the water taxis waiting below the steps and maybe step into some of the shops. Bruneians LOVE food and I swear, Bruneians are the biggest foodies that I’ve ever met. Not surprisingly, the BSB night market is absolutely amazing. Just bring enough cash with you as most booths are cash only (at the point that I visited). If you’re interested in some famous foods of Brunei, you need to try the dried squid with chili, the chicken tail (surprisingly good), or the sticky desserts. Ask any local who will be happy to tell you their favorite stalls at the Gadong night market. 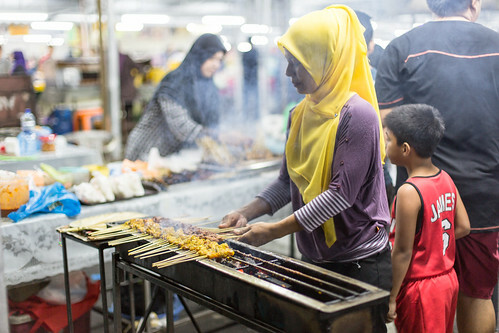 Brunei has other food halls (more in the Singaporean style) elsewhere where you can try some amazing seafood that can be quite spicy, but the night market is easy to get to without a car. They’re in the process of building an closed-top open-market in the style of the other market to help accommodate more food stalls. Expect Singapore prices. Ambuyat is a truly unique food from Brunei that is made with sago palm. The most famous place to have Ambuyat is at a restaurant called Aminah Arif. You get a massive portions and it’s perfect for sharing. We ended up with five different dishes with five people and there was food left over. The idea is that you use a special fork to roll it (like spaghetti) and dip it into the other dishes. If you’re picky about textures, you might dislike Ambuyat as it has a distinct gooey texture. Jacob absolutely loved it and couldn’t get enough of it. Brunei is a bit tough without a car beyond the centre, however you will not want to miss the amazingly impressive Jame Asr Hassanil Bolkiah mosque in BSB. It is truly a masterpiece and it’s especially impressive at night in my opinion. You’ll probably pass it coming from the airport as it’s a couple miles outside of the downtown area. Be sure to note the traditional Bruneian designs that were pointed out to us and I then ended up seeing everywhere. Also, be sure to find the Sultan’s escalator at his personal entrance to the mosque. It’s typically covered up, but can you imagine having your own personal escalator?! I’ll keep dreaming! I’m not usually into hotels, but the Empire Hotel was originally intended as a palace and it FEELS like a palace. Luckily, the locals also come to enjoy the beautiful interior with its three story parlor and its spectacular beachfront views. This is also where celebrities come to stay in Brunei, so if you want to see how the other half stays on vacation, consider visiting Asia’s fanciest hotel…. When you visit, remember that all the gold is real. The Jubilee Park can be seen as you exit the downtown area, but it was full of beautiful orchids when we visited Bandar Seri Begawan. Unfortunately, the heat (even in January) made us a bit sluggish, so we didn’t get to fully enjoy these grounds, but definitely impressive. People who have been to Singapore will find the setup of this open market very familiar. You’ll find vendors selling fresh fruits, veggies, souvenirs, and juices in this open market. After the heat, it felt really good to have a cold fruit beverage, so I recommend browsing. You might also spot some of the market cats! Although Brunei is predominantly a Muslim country, not everyone is Muslim and this Chinese temple is a great reminder of Brunei’s diversity. The Chinese temple is free to visit and quite nice inside. We didn’t get to this museum in BSB, however they have an old long-house and show displays on traditional Bruneian crafts. It’s a favorite of visitors, but we just ran out of time. This beautiful park in BSB is known for its peaceful glimpse into the jungle as well as its picturesque waterfalls. If you don’t have time to go out to Ulu Temburong National Park, you will want to visit this park in Brunei. If you’re visiting Bandar Seri Begawan, I recommend booking your hotel in Bandar Seri Begawan early. I twice lost the hotel that I was considering booking as I waited just a few days. There’s not that many hotels in the region, so book early. I stayed at the Kunyit 7 Lodge, which was a great experience for those looking for a local experience. For those looking for the luxury experience, consider staying at the Radisson or the Empire Country Club. You’ll also find other mid-range options. Check hotel prices in Bandar Seri Begawan now! In sum…there are A LOT of things to do in Bandar Seri Begawan. If you’re coming to Brunei, I recommend about four days with 2-3 days spent in Bandar Seri Begawan with doing a day trip to Ulu Temburong National Park. Have you visited Bandar Seri Begawan? How many days did you spend here? Click for my complete itinerary for Borneo!